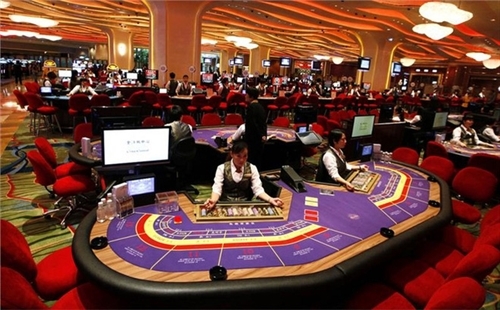 Tax offices would directly supervise operations of casinos in localities, proposed the Ministry of Finance (MOF) in a draft circular guiding the management and supervision of tax collection for casino business activities under Government Decree 03 issued in January. Accordingly, the surveillance team of a local tax office would supervise transactions related to cash and tokens, such as token or point exchange, prize payout, seal removal, inventory of transactions at counters, and counting of cash or tokens. This team, expected to be formed by the director of a local Tax Department, would perform the supervision directly or via electronic devices and cameras at a place in the casino, and report the surveillance results and any violations to such director for settlement. As required by the draft, cameras must be installed at gambling tables, gambling machines, treasuries, counters and in other areas related to casino business to facilitate the surveillance work. Also, data of the camera system must be stored for at least 10 years. The MOF noted that a member of the surveillance team must not have any relation with the casino’s manager and must not be the spouse, parent, adoptive parent, offspring, adopted child, sibling, adopted brother or sister, brother-in-law or sister-in-law of another. The ministry also proposed that casino businesses would have to use computer software for revenue and expense management and for data connection with tax offices with a view to correctly and fully collecting value-added tax, excise tax and corporate income tax from casino businesses. In case an enterprise was licensed for casino business before the effective date of Decree 03 (March 15, 2017) and has commenced the business operations, it would have to arrange a place with necessary devices inside the casino for the surveillance team within 90 days after this circular takes effect. If the enterprise was granted the above license but has not yet started the business operations or if it obtained such license after the above date, it must reserve such a space as soon as it conducts casino business activities.